“It’s too far away,” agree Madison Hood and Jim Hower when the question arises about Hood’s plans to pursue a Ph.D.. After all, Hood just graduated from high school. And yet the question is not that abstract considering Hood is sometimes mistaken for a graduate student because of her contributions to the research directed by Professor Jim Hower of UK’s Center for Applied Energy Research (CAER) and the Department of Earth and Environmental Sciences. Hood is already on her way to an academic career if she wants to pursue it (but, of course, she has yet to start her freshman year). Hower attributes her unique experience to the fact that Hood went to a high school that is invested in research and located near a research university. As a high school student at Paul Laurence Dunbar High School in Lexington, Hood participated in the school’s STEM program called the Math, Science, and Technology Center (MSTC). “Basically, it’s a magnet program where you take advanced STEM classes throughout the four years and then your junior and senior years you do a capstone research program at UK,” Hood explained. When students in Dunbar’s MSTC program reach their junior year, they choose a STEM subject to specialize in and seek out UK professors willing to have them work in their labs. Hood chose to focus on Earth science since she has always enjoyed the outdoors and has been involved in the Bluegrass Sustainability Council, an environmental activism group for high school students. Hood learned about CAER from a family friend and investigated the research options for geological Earth science. 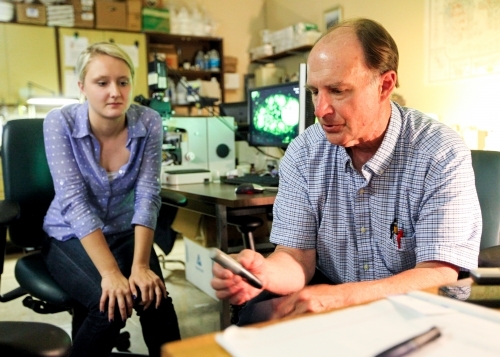 Hower’s research focuses on coal and fly ash petrology and the by-products of coal combustion. He is also an author on more than 300 academic articles, so she knew he was an active researcher and scholar. “Dr. Hower was my first choice,” Hood said. She has some friends who have had to do some shifting around to find the right setting for them, but Hood has been happy with her work in Hower’s lab. Hower has been at UK for nearly 40 years and spends his days in his lab at the CAER research facility on Iron Works Pike. Hower admits that even though he has an office in the building, he often doesn’t get there in a given day because he’s so involved in the lab. For that reason, he works closely with his students, providing mentorship and training. Hower notes that Hood “is already playing with microscopes here that are much bigger and more powerful than what she’s going to be dealing with in petrology classes in the department. “A lot of the things that I’m learning in class have been instilled so much more by being able to do it hands on,” she said. By getting a jump on undergraduate research as a high school student, Hood has accelerated her education, developed valuable lab skills, and made a contribution to STEM research at UK. Hower also points out that through Hood’s work in the lab, she now has contacts with scholars at universities all over the U.S. and even in other countries. This could be extremely helpful should she decide to pursue a Ph.D. somewhere further down the line. For now, Hood says she’s looking forward to being a freshman and living on campus. “I’m really excited for K Week. It’s supposed to be a lot of fun — they have a big water balloon fight.” She’ll also have a job in Hower’s lab for as long as she wants. Hood’s research experience and professional contributions to the field of petrology make it easy to forget that she is just starting out on what is sure to be a rich academic career.